Fifteen Southern University researchers and seven students presented 28 research projects at the 15th Biennial Association of Research Directors’ Symposium. Students, faculty, and staff from the nation’s historically black land-grant universities converged in Atlanta, Georgia, March 28-April 1. Three presentations were made in the emerging technologies category, 11 in renewable resources, four in food safety, one in human nutrition and health, and nine in small farms and rural development. 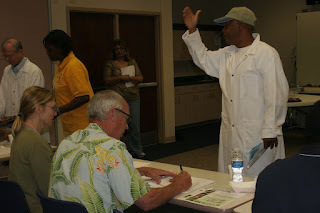 Researchers from Southern University Ag Center made five oral presentations in two categories. All symposium attendees were sponsored by the Southern University Agricultural Research and Extension Center. “Nanotechnology Application in Forest Health Management” by Yadong Qi, Ph.D. The purpose of the symposium was to showcase the land-grant commitment to teaching and research by sharing research information, and highlighting research accomplishments. The Southern University Ag Center is starting a professional development series to be hosted quarterly. The first session, "How to Use a Digital Still Camera," will be held tomorrow, Thursday, April 30 at 3:30 pm in Room 191 of the Ag Center. Chris Rogers, director of technology services, will teach the Rule of 3s; how to take, download, save and email pictures; and proper camera care. This is a hands-on training, come with your camera and all accessories. Goat producers from across the state exchanged ideas and learned new strategies Saturday at the Southern University Ag Center's annual goat field day. 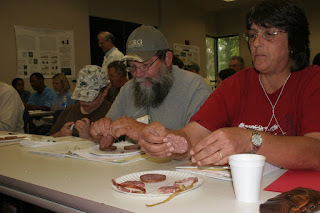 Ag Center research associate and retired USDA meat specialist Curtis Chisley (pictured) surveyed participants' opinion of goat sausage. Chisley and Albert Howard, meat manager, made four samples of goat sausage from 100% goat meat to a 50%-50% goat meat and pork combination. Fatemeh Malekian, Ag Center food scientist, analyzed the nutritional value of the variations and provided the findings to the producers. The group most preferred the 100% goat sausage and a sausage with goat and pork. "This shows promise for goat producers," said Chisley. "There is a market for goat products in the state." For complete coverage, see Advocate article SU hosts Goat Day <http://www.2theadvocate.com/news/43733417.html> . Southern University Ag Center's goat researchers, farm managers, and research assistants, along with LSU staff, conducted a successful goat field day today. The day brought a taste of goat and lessons on herd management for adults and children. See a few photos on our Facebook page. Part two of the Who Moved My Cheese seminar presentation will continue on tomorrow. Faculty and staff are invited to participate in this hands-on professional and personal development session. Participants completed a S.W.O.T analysis during Part 1. Session presenters Dawn Mellion-Patin, Ph.D, MBA, agricultural specialist, and Candace Semien, communications coordinator, said participants will develop individual plans on tomorrow to prepare for when "the cheese moves or is cut". "The interesting thing is that it does not pertain to cheese but life as we know it. You need to hear it even if you have not read the book yet," said Bridget Udoh, Ph.D., communications specialist. The presentation is tomorrow, Thursday, April 23, in the Ag Center, Room 191, at 3:30 p.m.
"Who Moved My Cheese?" presentation is part of the seminar series presented by faculty and staff of the Southern University Ag Center and the College of Agricultural, Family and Consumer Sciences. The seminars are held every other Thursday at 3:30 p.m., free of charge and open to everyone. If you would like to present, or have questions, please contact James McNitt, Ph.D., at: (2325) 771-2262 ext. 270. 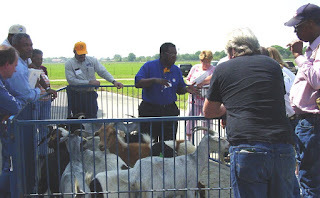 Louisiana goat producers are invited to learn more about basic goat health care, including artificial insemination, during the 4th Annual Goat Field Day, Saturday, April 25, 2009, at the Southern University Ag Center in Baton Rouge. The field day will feature presentations on basic goat health care, direct marketing and product development, cost benefit analysis, artificial insemination, forage based production, parasite control including, and FAMACHA training. The day will also include demonstrations and hands-on learning for a number of basic goat husbandry tasks. A fee of $5 (pre-registration) and $10 (on-site registration) will be charged. Those who are interested in becoming FAMACHA trained will incur and additional $10 for the color guide chart. Registration will begin at 7:30 am in the Ag Center, A.O. Williams Hall, and the program will begin at 8 am. Spring is the time to begin planning snap beans, butter beans, collards, cucumbers, eggplants, cantaloupes, okra, Southern peas or field peas, peanuts, pumpkins, winter squash, summer squash, sweet corn, sweet potatoes in late April, tomato transplants, pepper transplants, and watermelons. Now is the perfect time to begin planting Cucurbits especially for transplants, which you should start in pots two or three weeks before transplanting. All members of the cucurbit family can be planted in May, but yields of squash and cucumbers may be lower than normal with the late plantings. Mila Berhane, Southern University Ag Center senior research associate, sustainable agricultural systems, reminds gardeners to plant cucurbits outside well after the danger of frost is over. Learn about more gardening tips for these spring crops and others at www.suagcenter.com under the Garden Tips topic. Parent educators, child care providers, and health care and other family service professionals from across the state are gathering later this week at the Baton Rouge Marriott to gain professional skills, learn methods of evaluating programs, and develop emergency preparedness plans during the Southern University Ag Center's Family and Health Conference. The conference, “Building Healthy Foundations for Families,” explores best practices, new strategies, and effective approaches to addressing the challenges Louisiana families face, said Southern University Ag Center chancellor Leodrey Williams. “In order for our state to improve, we have to continue creating, implementing, and sustaining programs that strengthen families and empower healthier lifestyles,” Williams said. Presenters include representatives from Southern University Ag Center, Louisiana Department of Health and Hospitals, Texas AgriLife Extension Service, Louisiana Department of Social Services, LSU AgCenter, Prairie View A&M University, Woman’s Center for Wellness, Office of Public Health, and Louisiana Spirit. Read more on the family and health conference at www.suagcenter.com. Taking care of children can be challenging, but administering medicine when a child is sick can be an even bigger challenge for parents. When giving prescription or over-the-counter medicine, safety should always be a parent's top concern. First and foremost, parents need to make sure that they have carefully read the dosage instructions and are giving the right amount at the right time. Keep in mind, young children under the age of 2 must have doctor's approval before given over-the-counter medications. Read eight tips for parents and child care providers to consider before administering medicine to young children. U.S. Agriculture Secretary Tom Vilsack presided over the graduation ceremony of 26 minority farmers from the Southern University Ag Center’s Small Farmer Agricultural Leadership Training Institute. The Institute is a two-year course of study that gives small, socially disadvantaged, limited resource and/or minority farmers the knowledge to become successful agricultural entrepreneurs. "President Obama recognizes that small farm operators are the custodians of about 48 percent of this nation's farm and ranch land," Vilsack said. "It's vital that we support programs such as this that provide the tools needed to promote the sustainability of small family farms." This is the second class to graduate from the program with the first taking place in 2007. Throughout the course, participants studied a broad range of agriculturally-important topics, including the effects of global agriculture on the U.S. economy; leadership and analytical skills; business management and marketing, communications; and public policy. The program is unique in that it is the only one in the country specifically targeting minority, socially disadvantaged and limited resource agricultural producers. Participants were from Louisiana, Mississippi, Alabama, Kentucky, Texas, Missouri, Tennessee, South Carolina, Florida, Georgia, Maryland and North Carolina. The most dynamic aspect of the Institute is the relationships that have been built. “Each session I sit back and watch the participants interact, assist and motivate each other as if they have known one another forever. The camaraderie is phenomenal," said Dawn Mellion-Patin, Ph.D., institute director and Ag Center agriculture specialist. The Southern University Ag Center has collaborated with the Southern University Law Center, Alcorn State University Small Farm Development Center, Prairie View A&M University Cooperative Extension Program, and North Carolina A&T State University Cooperative Extension Program to bring the Institute to the farmers in various locations. The ceremony was held at the USDA headquarters, in the Jamie L. Whitten Building on March 27. USDA's Cooperative State Research, Education and Extension Service administers and funds the program through the Outreach and Assistance for Socially Disadvantaged Farmers and Ranchers Program, which teaches participants the enhanced decision-making skills and leadership development to become successful agribusiness managers and community leaders. Patin is currently pursuing multiple funding sources to sustain this unique institute. For more information on the Institute, visit www.aginstitute.suagcenter.com. WASHINGTON DC--US Secretary of Agriculture Tom Vilsack congratulated the 26 graduates of Southern University Ag Center's Small Farm Agricultural Leadership Institute. The Institute's program director and Ag Center agricultural specialist Dawn Mellion-Patin,Ph.D., MBA, said this unique program helps farmers become proactive leaders and producers. Patin is developing a curriculum for the third Institute class. AJ Sabine covers the ceremony in Washington DC for This Week in Louisiana Agriculture. The show is broadcasted nationally by the Louisiana Farm Bureau. For more information on the Institute, visit www.aginstitute.suagcenter.com or contact Patin at (225) 771-2242. MONROE--State Sen. Francis Thompson told community and government leaders last week that the Louisiana Delta Initiative might be the region's "last best chance to do something in the Delta". During a two-hour summit, "One Voice: Communities Moving from Poverty to Prosperity", committees brought together action plans on improving access to education, health care, jobs, and broadband connectivity in the region where one out of every four people live in poverty. "We hope those attending realize these are concepts that will require further development and more involvement by others in the region to bring about real change," Southern University Ag Center agent Glenn Dixon told the Monroe News Star. Southern University and LSU Ag centers have led the development of the initiative since last year, in collaboration with economic development groups in the Delta area. A team of professionals have been recruited to address poverty issues in Caldwell, Catahoula, Concordia, East Carroll, Pointe Coupee, Richland, Ouachita, Tensas, West Carroll, Franklin, Madison, and Morehouse parishes, said James Barnes, director, LSU Ag Center's Delta Rural Development Center. Brandon Dorn is only 19 years old, but he’s experienced numerous hardships which led him down an undesirable path. With mounting pressures at school and home, Dorn began using tobacco four years ago because, he said, it was “something to do and it calmed my nerves.” Although it was something to do at the time, Dorn said, he soon realized smoking wasn’t the right thing to do—at least not for him. “I stopped because I have a future! 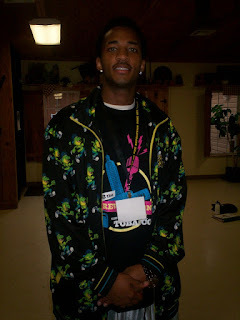 I had scouts coming to watch me play basketball and football, and I had to get myself into shape. I didn’t want to ruin my chance of going to college and an opportunity for a better life. If I could go to college, then I could really go somewhere and achieve my dreams. A lot of people helped me out; I didn’t want to disappoint them. I didn’t want them to know that I was hurting myself by smoking, so I just stopped. I could smoke if I wanted to, but I really don’t want to smoke anymore!” he said.